MotoGP Malaysia Could There Be Anymore Drama! The Malaysian MotoGP that took place on the 25th of October 2015 has to go down as one of the most intense MotoGP races ever. 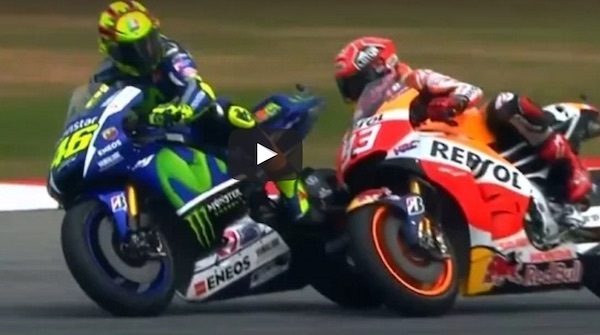 This is because of the scrap that took place between Marc Marquez and Valentino Rossi. In the preceding Australian GP, it appeared that Rossi and Marquez had an unbelievable scrap which resulted in Rossi finishing 4th. However what is interesting is that just before the race ended, Marquez shot off into the distance and won the race which gave rise to the question, why was he battling so hard with Rossi in 4th? Well in the press interview that occurred before the Malaysian MotoGP Rossi explained exactly why there was such a huge battle. In a a nutshell, Rossi said that Marquez was battling with him (for a personal reason) so that he could loose time and let Lorenzo finish ahead of Rossi therefore scoring more points. But why would Marquez do this? Simple, Rossi has an extensive history in MotoGP and holds many records, if Marquez can prevent him from winning another championship, he has less work to do to equal or even surpass Rossi’s records. Remember Rossi’s contract with Yamaha ends at the end of 2016, and because of his age, it is highly unlikely that he will win another championship. In the end, Marquez got what he wanted and managed to stir the pot with Rossi during the Malaysian GP. He made 2 strange mistakes managing to ‘outbrake’ himself and run wide from second place. This firstly allowed Lorenzo to pass and then Rossi to catch up as he was in 4th at the time. Miraculously as Rossi caught up, Marquez all of a sudden made no mistakes and scrapped with Rossi for 4 laps as they overtook each other in almost every corner. The result, Rossi ran wide in a corner deliberately trying to slow down Marquez, there was contact, and Marquez crashed. See video below and draw your own conclusions. Meanwhile Dani Pedrosa and Jorge Lorenzo ahead were riding off into the distance. Remember Marc is on the 2014 Honda, the one he managed to win the championship on, and easily beat Dani, so there is no excuse for him to be battling behind Dani. As a result, Rossi now starts from the back of the grid for the final MotoGP race of the season held at Valencia on the 8th of November. He also received a 3 point penalty and is now only 7 points ahead of Rival Jorge Lorenzo. Marquez knows it wasn‘t red mist that caused the incident. It‘s very clear from the helicopter footage that I didn‘t want to make him crash, I just wanted to make him lose time, go outside of the line and slow down, because he was playing his dirty game, even worse than in Australia. When I went wide and slowed down to nearly a stop, I looked at him as if to say ’what are you doing?‘. After that we touched. He touched with his right underarm on my leg and my foot slipped off the foot peg. If you look at the image from the helicopter it‘s clear that when my foot slipped of the foot peg, Marquez had already crashed. I didn‘t want to kick him, especially because, if you give a kick to a MotoGP bike, it won‘t crash, it‘s very heavy. For me the sanction is not fair, because Marquez won his fight. His program is OK because he is making me lose the championship. The sanction is not good, especially for me, because I didn‘t purposefully want to make him crash, I just reacted to his behaviour, but I didn‘t kick him. You can‘t say anything in the press conference, maybe it changes something, but to me this was not fair, because I just want to fight for the championship with Jorge and let the better man win, but like this that‘s not happening. Like I said, I didn‘t want to make Marquez crash, but I had to do something because at that moment Jorge was already gone. 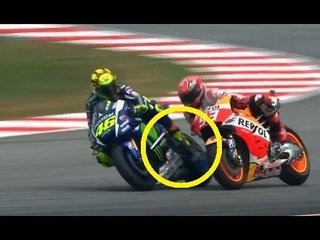 The championship is not over yet, but this sanction cut me off by the legs and made Marquez win. It was a very hard race. I gave the maximum to keep Dani‘s rear wheel as close as possible, but to be honest his pace had been unbelievable. He was so quick and consistent and picked up the bike in a perfect way, so it was very difficult to overtake him on braking. I could only finish in second place, which is important because we recovered points. When I saw the battle between Marc and Valentino I was really surprised because the action was huge and I have to respect race direction‘s decision. It‘s a shame to see such a beautiful championship, that was supposed to result in one of the most exciting battles between the two Yamaha riders, be affected and almost compromised by another rider. We should be here today dealing with Jorge‘s amazing performance on track and his second place, as well as another thrilling battle among top riders but unfortunately this is not the case. We made an appeal to the FIM stewards against the penalty issued by the Race Direction because whilst we respect the infringement, we felt 3 penalty points were too harsh. We have since heard that the appeal has been rejected. We respect this final decision. There is no wonder that Marquez and Lorenzo have received some harsh criticism after this latest series of events. It is unsportsmanlike. However one thing is for sure, MotoGP as a sport, will receive a lot of publicity.